The size of the planting stock will determine which support system to use, Sally Drury advises. Q. Which trees need support via staking or guying? A. The need to stake and tie or guy, or use underground supporting systems, is determined by the size of the planting stock. It is generally considered necessary to provide support to newly planted trees when a pit has been excavated to accept the tree roots. Support is not usually required for whips and stock shorter than 1m where the plant is inserted into a slot or notch created by a spade or planting spear. Q. What is the best size for a stake and should I put it in the pit before or after the tree has been planted? A. If you use the single-staking method, then the stake should penetrate the soil to 60cm or to a depth where it is stable and will provide good anchorage. For most trees the stake should extend around one-third of the tree's height. In this way the roots receive the steadying support they need while the stem is able to sway and thicken. If the tree is particularly flexible, you might consider a longer stake in the first year and then cutting it shorter. It is worth noting that few people stake right into the crown of the tree these days. Doing so will create a fulcrum or leverage point in a vulnerable part of the tree. Single-stake support is suitable for feathered up to standard trees, and especially for field-grown stock. When using the single-stake method, always insert the stake into the tree pit before settling the tree into place. The stake should be on the side subject to prevailing winds. Q. Using a single stake is one option. What are the others? A. Doubleor triple-staking are used for container-grown and root balled trees because stakes can straddle the root ball. In this instance, stakes are normally positioned after the root ball has been lowered into the planting pit. If you are planting on a slope, an angled stake does a good job of providing support. The stake can be driven into the ground before or after planting and should be at a 45 degs angle, leaning into the prevailing wind. Another option is above-ground guying. This method is useful for large trees and involves securing strong wires to low stakes that are driven into the ground at 45 degs and work like tent pegs. To prevent chaffing, the wire is covered with rubber piping at the point that it wraps around the tree. Q. Underground guying or anchoring seems expensive. Why do people use this method? A. 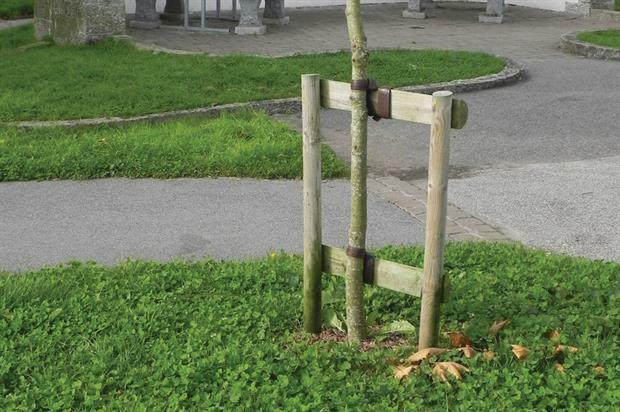 Underground systems, such as the Platipus Tree Anchor, are used to support root balled stock in situations where above-ground support may not be effective due to the size of the tree or where above-ground stakes or wires would detract from the tree's appearance. Placing the support underground also removes any above-ground trip hazards and has the additional benefit of allowing the stem total freedom of movement but still holding the root system steady while it establishes in its new home.